Turkish artist Semi.ok found a creative way to integrate the tree behind the wall. 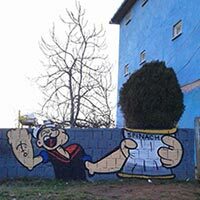 Popeye is nothing without his spinach, so Semi O.K found a clever way to give the Sailor Man a whole bunch of it! This piece was spotted in Istanbul, Turkey.